Setting nicely on Lamai beach, the one of the island’s beautiful beaches, Sand Sea Resort & Spa is a perfect place where offers you the excitement of leisure activities and pleasures of tranquil retreat. Our spacious 31 bungalows, 2 Pool Villas and 16 rooms in 2 storey- building are fully furnished in contemporary Thai style, which offer super comfort and convenience. Owned and operated by the local family, all bungalows are very close to the beach , the last row is 20 meters from the beach. All rooms are air-conditioned, TV, private bathroom with hot shower, complimentary water and coffee every day, free safety deposit box. Beautiful bath tub in the harmony of nature style offered in The Royal Suite , Deluxe and Superior bungalow. Pool Villas and Junior Suites also provide private Jacuzzi bathtub. We are about 20 minutes away from the airport. The Lamai center (night life and shops) is 10 minute walk by the beach. Swimming pool with children and Jacuzzi section is on the beach. The relaxing spa treatment on the terrace by the beach or in private room is available. 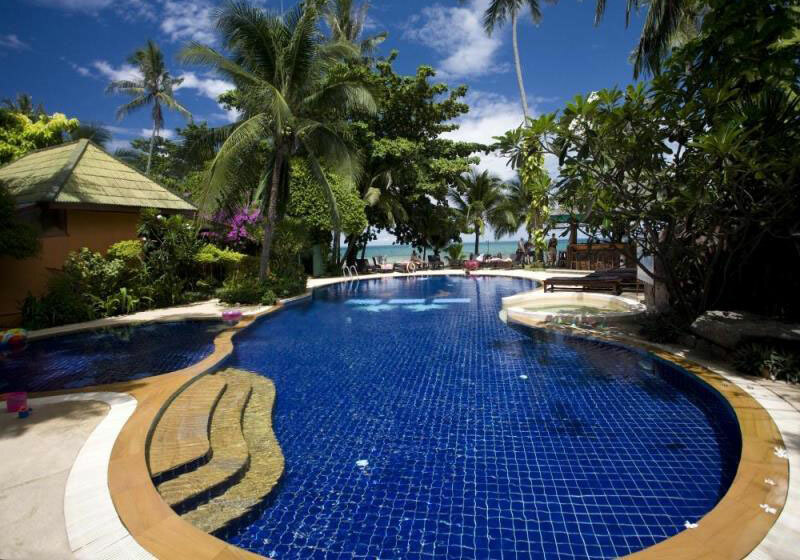 Short Description: Setting nicely on Lamai beach, the one of the island’s beautiful beaches, Sand Sea Resort & Spa is a perfect place where offers you the excitement of leisure activities and pleasures of tranquil retreat. Our spacious 31 bungalows, 2 Pool Villas and 16 rooms in 2 storey- building are fully furnished in contemporary Thai style, which offer super comfort and convenience.